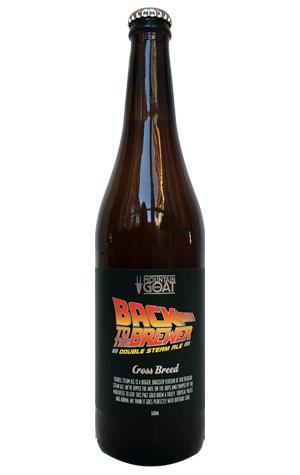 When Mountain Goat turned ten, they brewed the Double Hightail – a version of their original beer with twice the proportion of hops and malt and a hefty extra dose of booze too. For their 15th, they rolled out a Triple Hightail. So, when the brewery turned 20 this month, they brewed a Quadruple Hightail. Except they didn't. Instead, they gathered the four head brewers from the two decades – co-founder Dave Bonighton, Jayne Lewis (now Two Birds Brewing), Dave Edney (now Hop Products Australia) and current incumbent Ian Morgan – who set about creating a double version of the brewery's biggest seller, Steam Ale. Now, if we're honest, this might not be the sort of move to cause tremors of anticipation throughout the craft beer world. As Dave B admitted in our look back at the brewery's two decades, it was designed as a "quaffer" and went against his ethos up to that point – even though he went on to realise it was a smart move, with the beer becoming their main driver of growth since. Yet Double is a far cry from the original, with the quartet effectively turning it into a New England style cloudy double Steam Ale. It comes with the soft, full mouthfeel and barely perceptible bitterness of a NEIPA and is effectively a delivery system for an explosion of tropical hops; Aussie Cascade forms the basis and this year's Galaxy – a particularly spectacular crop, we're told – provides the fireworks. A worthy birthday brew.